This blog post on Russian translator Samuil Yakovlevich Marshak was written by Visitor Services Assistant Jim Andrews. I think it would be true to say that the majority of non-English-speakers who have delved into the works of Robert Burns will have done so through translations. Our Russian-speaking guests will be familiar with the work of Robert Burns through the translations of Samuil Yakovlevich Marshak. 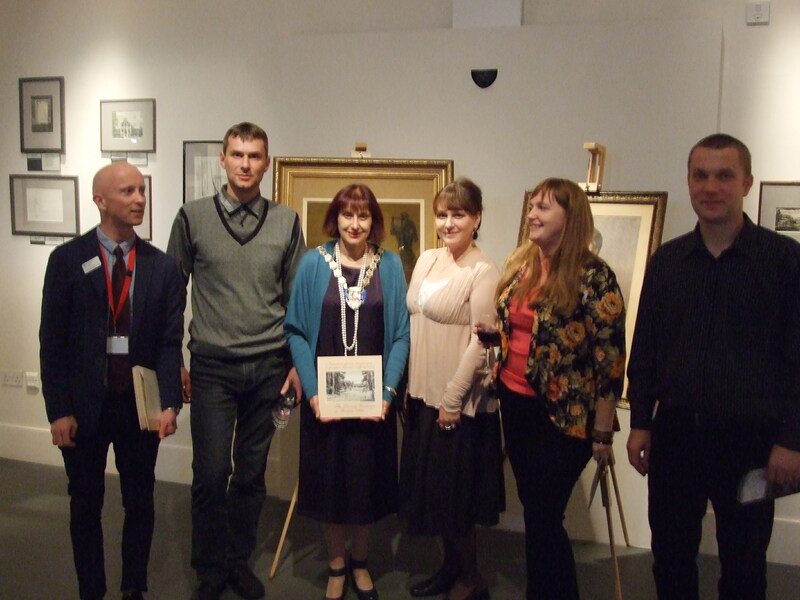 I have met Russian visitors who had come to us carrying a copy of Marshak’s translations. I first came across Marshak at secondary school: our Russian teacher, a Burns enthusiast, thought it might be fun to have us learn “Scots Wha Hae” in Russian. As I recall, we did not share his notion of fun. Usually translators, however talented they may be at what they do, remain in the shadow of the original authors. Not so with Marshak. In Russia he is certainly more famous than our Robert Burns. He is an author in his own right, best known for his children’s literature. As a translator, he has provided Russian-speakers with access to a vast swathe of English literature, from Shakespeare’s sonnets, through the Romantic poets of the 18th and 19th centuries (as well as Burns, he translated Keats, Shelley, Wordsworth among others), and on to the works of Rudyard Kipling and A. A. Milne. His translations of Shakespeare’s sonnets are widely considered to be virtual classics of Russian literature in their own right. His life story is every bit as interesting as Burns’s, though very different. He lived through the Russian Revolution and the Stalin era. Being a Jew in Russia at that time could have been a problem for Marshak. However, his prodigious talent was recognised and he eventually became head of the children’s branch of the Soviet state publishing house. 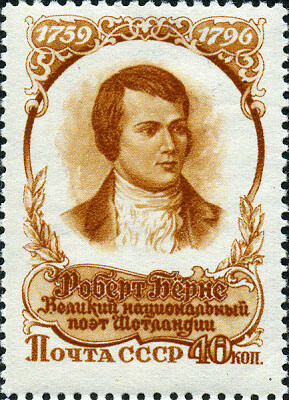 And, along with our Robert Burns, he shares the distinction of having had his face appear on Soviet postage stamps. Unfortunately some things can get “lost in translation”. Inevitably the flavours of the Scottish dialect are lost, as Marshak quite understandably used standard literary Russian. However, there is another aspect of Marshak’s work which has to be taken into account. In the Soviet Union writers did not have the freedom to write whatever they wanted: the Soviet government imposed a doctrine of “socialist realism” for all forms of artistic endeavour. This also covered translations of foreign authors, whose works either had to conform to this doctrine or could be “adjusted” to conform. Burns fell into the latter category and it has to be admitted that Marshak did some adjusting. Soviet ideology did not tolerate religion of any kind and all references to religion were purged or altered, making Burns seem humanist, even anti-clerical. Burns’s Scottish patriotism was watered down and his egalitarian ideals were emphasised. 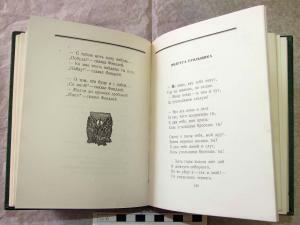 Essentially the Soviet reader of Marshak’s translations had to see communist ideology reflected in Robert Burns’s work, whether Burns would have liked it or not. Nonetheless, his translations earned him recognition here in Scotland: in 1960 he was made an honorary president of the Robert Burns World Federation. Of course, the Soviet Union is no more. Although a translator working today would provide a quite different, perhaps more authentic interpretation of Burns, Marshak’s translations are actually of an extremely high literary quality and remain the definitive translations (though not the only ones – some earlier translations were done during the tsarist era and they also were adjusted to make them politically correct, though in rather different ways). Burns remains a popular literary figure in Russia, but today’s visitor from Russia still sees Burns through very different eyes. This entry was posted in Exhibition, Object Focus, Robert Burns and tagged Alloway, Author, Ayr, Ayrshire, Burns, Exhibition, learning, literature, Marshak, museum, National Trust for Scotland, Object Focus, poetry, Robert Burns, Robert Burns Birthplace Museum, Russia, Samuil Marshak, Scotland, Scots, Soviet Union, Translations. 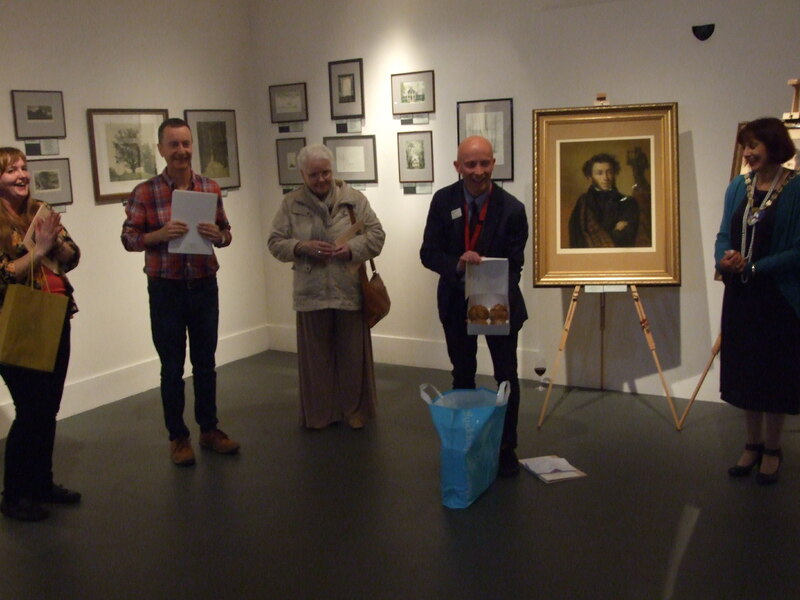 On the evening of Thursday 9th October, the Robert Burns Birthplace Museum unveiled its latest temporary exhibition. Conceived jointly by RBBM’s former Director Nat Edwards and the State-Museum Reserve of A.S Pushkin, ‘The Literary Landscape in Russian Art’ is an exhibition of 38 landscape paintings and original fine art prints by Russian artists who drew on the same landscapes that inspired the writing of the famous Russian poet and author Alexander Pushkin. The works span the decades from the early 20th to the early 21st century, and are on loan to RBBM from the State Memorial Historical-Literary and Natural-Landscape Museum-Reserve of Alexander Pushkin in Mikhailovskoye (Mi-kale-ovshka) as part of the Cross-Cultural Year of Great Britain and Russia. Many may wonder what connects these two historical figures beyond their shared literary prowess. Although Pushkin and Burns were not quite contemporaries, the Russian was born in 1799 just a few years after the death of our Bard. Both men wrote their first poem at the age of fifteen, both were Freemasons and both died at the tragically young age of 37. They are considered to be Romantic poets, with a strong focus on nature, as well as being humanitarians and believers in equality, and both sailed close to the wind with some of their political works, sparking governmental disapproval and even censorship in the case of Pushkin. Finally, both writers had a significant impact on the literary culture of their respective countries and beyond. Born in Moscow into nobility, Pushkin went on to produce many works, including his most famous play Boris Godunov and his novel in verse Eugene Onegin, later the inspiration for an opera by noted Russian composer Pyotr Ilyich Tchaikovsky. The unusual rhyme scheme used in this work has been termed the ‘Onegin Stanza’ or the ‘Pushkin Sonnet’, paralleling the Standard Habbie verse preferred by Robert Burns and often called the ‘Burns Stanza’, which showcases the respective literary influence of these two great writers. 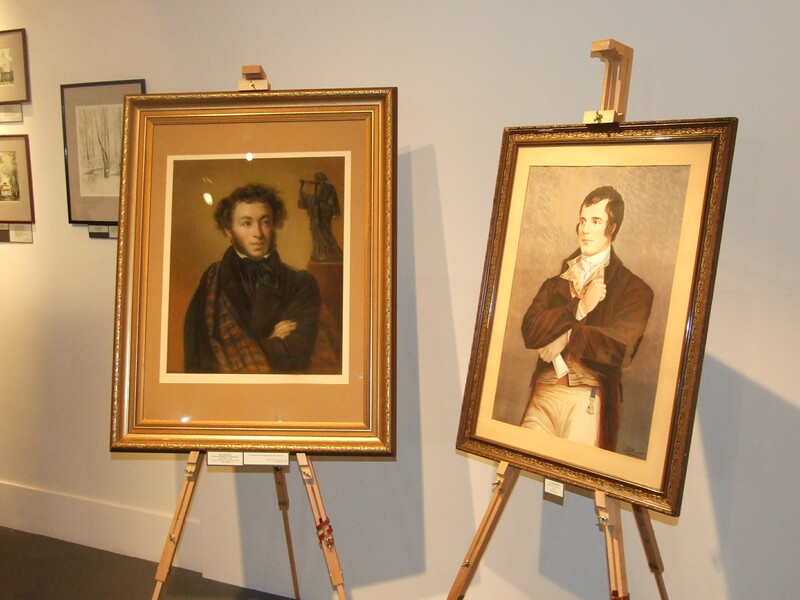 There is also a long standing link between Robert Burns and Russia, and arguably Russian interest in our Bard was initiated by Pushkin, who was himself an admirer of Burns’s work. 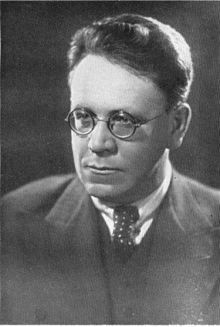 Translations of Burns’s works into Russian by a series of notable translators, particularly Samuil Marshak (1887-1964) also helped popularise his works in Russia, and in 1956 the Soviet Union was the first country in the world to feature Burns on a postage stamp. 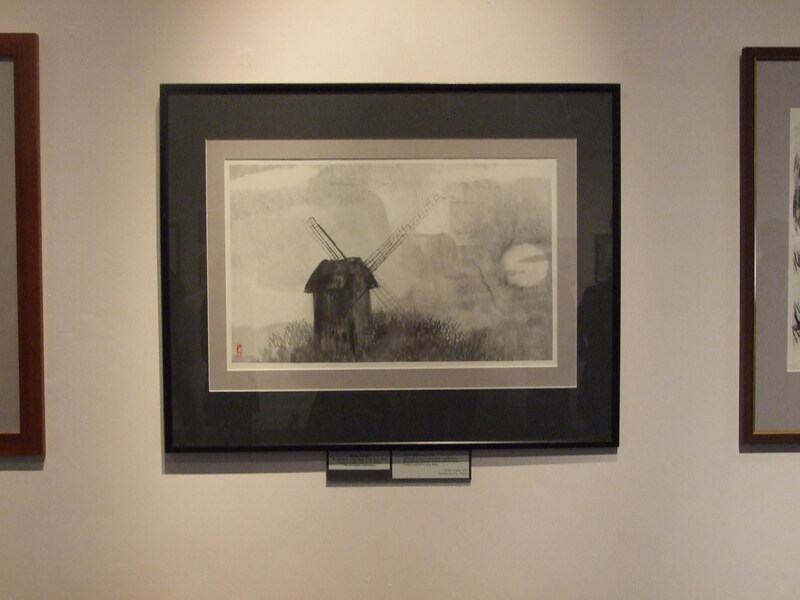 The exhibition will be running at the museum until February and entry is free. We hope you will be able to pay us a visit, and take advantage of this rare opportunity to see these artworks outside of their native country. Why not let us know your favourite in the comments section? Gifts were exchanged on both sides, including four homemade clootie scones from RBBM’s cafe! With thanks to: Georgy Vasilevich (Director of the Pushkin Museum), Alyona Boitsova, Vyacheslav Kozmin, Darya Plotnikova, Olga Sandalyuk, Tatiana Morozova, Pavel Tereschenko, Nat Edwards, David Hopes, Chris Waddell, Sean McGlashan and Gavin Pettigrew for all their work in organizing this fantastic exhibition. This entry was posted in Events and tagged Alexander Pushkin, Art, Eugene Onegin, Exhibition, Literary Landscapes, Mikhailovskoye, Moscow, Robert Burns, Romantic poets, Russia, Samuil Marshak, Tchaikovsky.